For the last month, the attention of sports fans around the world has been focused on South Africa as the soccer teams of 32 nations competed for the World Cup. And yesterday it concluded: Spain is the victor because of an extra-time goal by Andres Iniesta and massive celebrations continue today not only in the large cities of Madrid and Barcelona, but also in the small hamlets and villages of rural Spain. It was an exciting game, and one that even the cosmos seemed intent on recognizing. Fourteen minutes before the final game began, the umbra of a solar eclipse touched down on the Earth and lifted off just around the time the game concluded. It was as though, for a few short hours, the universe itself took an interest in the affairs of men and settled in to enjoy the game. There is perhaps no astronomical event as portentous as a solar eclipse. And yesterday’s was special not only because it coincided with the World Cup final, but also because of the remote path of the umbra. 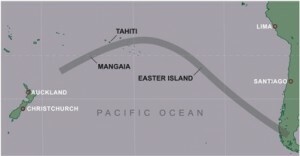 Travelling over the south Pacific, the eclipse was visible from very few land masses, all of them remote. 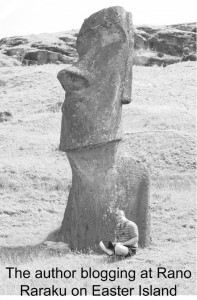 Indeed, tiny and mystical Easter Island, famous for its haunting stone moai and described frequently as the most remote inhabited place on the planet, was a particular focus for the eclipse. Thousands of people made their way there just to experience being within the eerie totality of a solar eclipse while standing among those ancient stone statues. The last time a total solar eclipse was visible from Easter Island was almost 14 centuries ago, probably before the island was even settled by Hotu Matu’a. 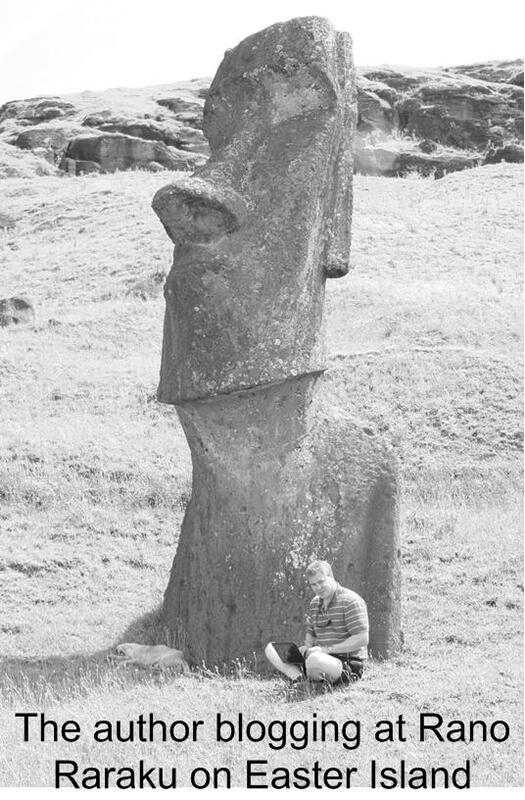 I am unable to say exactly when Polynesian explorers settled on Easter Island — radiocarbon dating of the Tahai complex suggests a date of 690 ± 130 AD, although it is possible Tahai was not constructed until a couple of hundred years after settlement of the island. But I can say with certainty when that previous solar eclipse occurred on Easter Island. It was on September 24, 656 AD. And those thousands of people who arrived on Easter Island took confidence in the fact that the eclipse would begin at 12:41 PM local time. Such is the level of understanding that astronomers have about the movements of the Earth, Sun, and Moon. We almost take for granted these days that we know the precise times the Sun or Moon will rise or set — for any day of any year and for any location on the planet. But what an amazing feat it is to have such predictive capabilities. The precision with which astronomers can provide information about such positions makes for evidence that can be used in court that has indisputable reliability. Such information is exact and has been used in numerous cases to sway a factfinder to a conclusion about a crime. It was famously used by Abraham Lincoln when he was an attorney representing Duff Armstrong in a murder case. Although Lincoln was mostly a civil attorney, he did take a small number of criminal cases, and had taken this one — pro bono — after being implored by Duff’s mother, the recently widowed wife of his old friend Jack. Duff and a second man named Norris had been accused of killing James Metzker during a drunken brawl sometime in August, 1857. The case seemed solid and unwinnable. There was, after all, an eyewitness to the event, a man by the name of Charles Allen. One can easily imagine the tension in the courtroom as the man who would later issue the Emancipation Proclamation to lead to the end of slavery stood and cross-examined the eyewitness. Lincoln proceeded with a series of questions designed to elicit testimony about how clearly Allen could see the altercation. How bright was the moon? Where was the moon? Are you absolutely certain there was enough moonlight that you could see clearly? These are perhaps the sorts of questions he asked. When Lincoln then introduced an almanac showing that the moon could not possibly have been overhead as Allen testified, a “roar of laughter” arose among the spectators and some of the jurors. The key witness in the trial had been discredited and the jury unanimously voted to acquit Duff with deliberations that lasted less than an hour. Today, astronomers are still called as expert witnesses from time to time. There are companies formed by astronomers that will calculate the position of the sun or moon at a particular location on a particular day to be used as evidence. Could the driver really have had the sun in his eyes when he was driving west down Elm Street at 4:38 PM on October 12? In a case in the late 1970’s, an astronomer analyzed a photograph of a woman and her dog to establish from the dog’s shadow that it could not have been taken when she claimed, resulting in her conviction for perjury. In any case where the state of natural lighting is relevant to the case, astronomers are able to provide absolute and inarguable evidence of the positions of these celestial bodies. Recently, such “forensic astronomers” have turned their attention to artistic endeavors, looking at paintings, photographs, and poetry in which celestial objects appear. 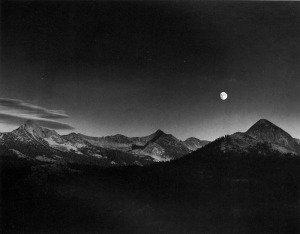 Ansel Adams’s photograph titled Autumn Moon, we now know, was taken at 4:14 PM on December 28, 1960. Van Gogh’s Moonrise must have been painted on July 13, 1889. And just last month, astronomer Don Olson settled a debate about what celestial object Walt Whitman was referring to in a poem that appears in his collection Leaves of Grass — it was not the 1833 Leonid meteor shower as many supposed, and it was not an 1859 fireball that others had thought, but was instead the Great Comet of 1860. I am personally disappointed that Spain won the World Cup since I was rooting for The Netherlands, but I do hope the cosmos enjoyed its visit and the game.